Karenn Chutjian Presti: "My First Armenian Songbook"
Sold at Sardarabad Bookstore (Glendale, CA), Abril Books (Glendale), the National Association for Armenian Studies and Research (Boston), DáDiva Shop, the Armenian General Benevolent Union bookstore (NYC), St. Vartan Cathedral, (NYC), St. John Armenian Church (greater Detroit area, MI), Berj Stationery (Glendale), and St. Vartan Armenian Church (Oakland). Private sales available; please fill out contact form below. 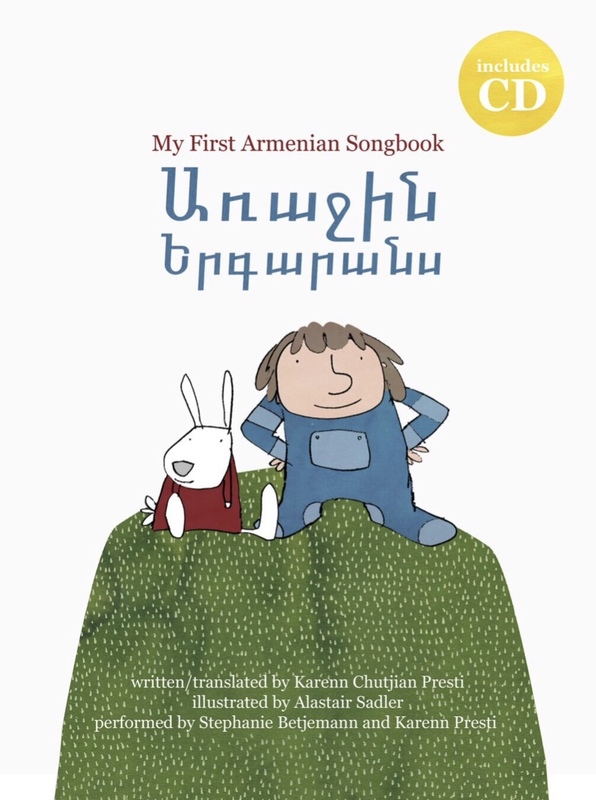 In this award-winning* songbook, English-language songs are presented along with their Armenian translations in order to celebrate both traditions. This comprehensive edition includes original translations of traditional songs from English to Armenian and one from Armenian to English. The book is ideal for children who are learning Armenian or are being exposed to Armenian culture. The rich English texts and the colorful original illustrations make it appealing to children of all backgrounds. For those who cannot read Armenian, a pronunciation guide with a full transliteration of each song is included at the end of the book. The professionally recorded, enclosed CD contains all the tracks in the Armenian language. The original arrangements by Karenn Presti are for voice and piano, in a folk/classical tradition specifically designed to be educational in terms of both language acquisition and musical taste to babies and children. UCLA's The Daily Bruin ran an article about the project, entitled "UCLA Lecturer Harmonizes Armenian, American Cultures Through Song." Here is the link. Alastair Sadler is a British illustrator who works in multi-media for children's books, websites, magazines, comics, posters, book covers, leaflets, greeting cards, and commercial projects. His work is available to view at sadlerillustration.com. Stephanie Chutjian Betjemann has cultivated her love of music through her background as a violinist and her participation in numerous choral groups. She is passionate about folk singing and is delighted to pass down the tradition of Armenian folk music through her participation in this project. When not singing, she deals with other functions of the vocal tract in her role as a speech-language pathologist. Karenn Chutjian Presti is a lecturer on Armenian music, nationalism in music, and vocal arts at UCLA. You can read more about her on the next page.